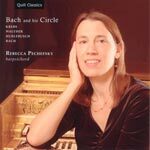 Harpsichordist Rebecca Pechefsky performs J.L. Krebs: Partita in A Minor, Hurlebusch: Suite in C Minor (both world premiere recordings), and Walther’s Wachet Auf and Fugue in F Major. All three were associated with J.S. Bach at various times. Ms. Pechefsky concludes the program with Bach’s virtuoso Chromatic Fantasy and Fugue. 1 disc.